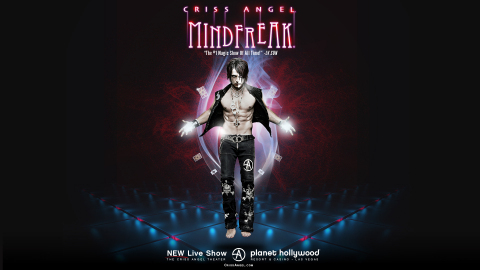 LONDON--(BUSINESS WIRE)--Hailed as the “#1 Magician on the Planet”, Criss Angel is using HYPERVSN’s 3D holographic technology to captivate and engage audiences attending his all new technology-driven theatrical spectacular: Criss Angel MINDFREAK® - in the newly-renamed Criss Angel Theater at Planet Hollywood Resort & Casino Las Vegas. Pulling out all the stops in the creation of the production for his multi-year headline residency, Angel chose to incorporate HYPERVSN’s proprietary 3D holographic technology to offer his audience a true immersive experience. From the moment audiences enter the theater lobby, they will engage with customized 3D content projected from a larger-than-life 28-unit HYPERVSN Wall. The bespoke content was produced by HYPERVSN’s in-house design studio with Criss’ personal direction and collaboration. Angel’s new 90-minute spectacular is the most sophisticated, technologically-advanced theater show the world of entertainment has ever seen, featuring more than 75 of his iconic signature illusions - with 20 never-before-seen effects that will give fans the ultimate immersive experience, showcasing the iconic Angel on a massive scale. HYPERVSN manufacture a fully integrated 3D system that scales from a single unit Solo to HYPERVSN Walls of 9, 12, 28 and larger, offering a 3D disruptive technology that the market has never seen before. To see HYPERVSN for yourself, visit the Criss Angel MINDFREAK experience in the Criss Angel Theater at Planet Hollywood Resort & Casino. Shows are Wednesdays through Sundays and tickets can be purchased at CrissAngel.com and Ticketmaster.com/crissangel. HYPERVSN is a young technology company responsible for developing the innovative and disruptive 3D holographic system that provides an immersive experience for viewers. From the global HQ in London, HYPERVSN services partners and customers across the globe. The company, founded in 2012 and initially backed by Sir Richard Branson, has recently attracted additional investment from Mark Cuban, among others. The proprietary HYPERVSN hardware works in conjunction with a platform of unique and robust software/content to provide customers with an integrated 360, high-quality business solution. Targeted business verticals include Digital Signage, Retail, Events, Education, Public Safety, and many other use cases. The Brand Line “See Extraordinary” encapsulates the approach the company stands for. Seeing is believing. HYPERVSN creates extraordinary experiences for people who view holographic visuals with a sense of childlike awe and wonder. Criss has been named “Magician of the Year” an unprecedented six times, was the youngest magician inducted into the International Magicians Society Hall of Fame, was named the first recipient of “Magician of the Decade,” as well as “Magician of the Century” and “Innovator of the Decade.” Most recently, Angel was given the highest honor in the magical arts - the Lifetime Achievement Award from the largest and most prestigious magic organization in the world (the nearly one hundred-year-old International Brotherhood of Magicians). It has only been given five times in the IBM’s history, and Criss is the youngest artist ever to receive it and the only magician performing today that has been presented with this award.